We invite you to experience what SnoGoer Magazine rates as one of the TOP 10 best places to snowmobile in North America. Our system of well groomed, interconnected snowmobile trails is world class. In fact, northern Maine is home to over 2,300 miles of snowmobile trails that offer days and weeks of endless sledding adventure. 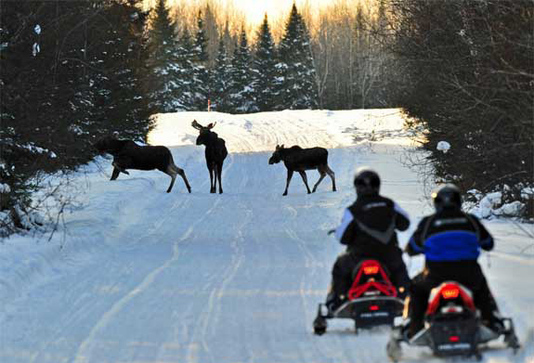 Snowmobiling in northern Maine is an experience you'll not soon forget. The northern Maine snowmobiling season usually starts in December and often runs well in to April. Natural snowfall is one of our most plentiful resources. Each winter our snowmobile trails are groomed by state of the art machinery through a network of snowmobile clubs working together to create our portion of the InterconnectedTrail System (ITS). from January through March, where we often measure snowfall in feet rather than inches. Our snowmobile trails are safe, well marked, and snowmobile trail maps are available at most Chambers of Commerce and many local area lodging establishments and stores. Take a ride on the ITS through northern Maine, or join us for the International Snowmobiler's Festival bringing U.S. and Canadian snowmobilers together for a weekend of cross border snowmobiling in northern Maine and western New Brunswick. Just imagine walking out of your hotel door to your snowmobile waiting in the parking lot and driving right off the lot and on to the trail. Many restaurants, stores, and other establishments are located on the snowmobile trail system in northern Maine. Access to lunch, dinner, gas, and other necessities does not require a car ride or a walk – sled right up to the front door and be greeted with a warm northern Maine welcome. What are you waiting for? Start planning your snowmobile trip to northern Maine today! 1. Division of Licensing and Registration, Department of Inland Fisheries and Wildlife, 41 State House Station, Augusta, Maine 04333-0041. Telephone: (207)287-8000. 2. Various agents throughout the state including many town offices, snowmobile dealerships, variety stores, etc. 3. On-line registration at the Inland Fisheries and Wildlife website. You can cross the International Bridge in Fort Kent, Maine to access the New Brunswick Trails and Quebec Trails. You will take downtown “river dike” trail #17 off ITS 85 near the FK Groomer Garage. Please note new bridge construction going on; trail exit temporarily rerouted a few hundred feet west of the current bridge/border crossing, at American Legion. You will ride the vehicle travel section and NOT on the sidewalk ; stop at customs in Clair, NB. You will need your passport or passport card. New Brunswick Trail #41 is located a few hundred yards rear of the Maple Leaf Restaurant. Trail #41 heads northwest through Baker Lake, NB and connects to Quebec Trail#35 in St. Marc Du-Lac-Long in Quebec. You can also take New Brunswick Trail #39 off #41 to head east to Baker Brook- Edmundston, connects to St. Basile Trail #12 and Moose Valley NB Trail #17. Customs on the U.S. and Canadian side are both open 24-7. Please verify you have insurance to ride in Canada. Please note that you need to Register either in New Brunswick or Quebec, or both depending where you ride, as those two provinces do not reciprocate with each other. Alternate Canadian Access is trail #92 North from Allagash to Estcourt Station,ME/Poheganamook, QC which will join Quebec Trail #35. Please Note- Estcourt Customs is open 6am-2pm Monday-Friday only. If you cross to Canada, you cannot come back after 2pm. Make sure you have enough fuel to cover 96 mile round trip from Allagash. Ouellette Gas Bar in Estcourt/American side is open 10am-11pm weekdays; their phone number is 418-872-9155. All snowmobiles must stop at Customs to cross a Canadian/U.S. border. There is a $5000 penalty for not stopping in addition to the loss of your snowmobile. There are also new requirements for cross the United States Canada border.